An espresso blend is normally not my first choice for a brewed drip coffee because some of the somewhat burnt notes resulting from a dark roast become too strong (and bitter) when pulled as a drip. 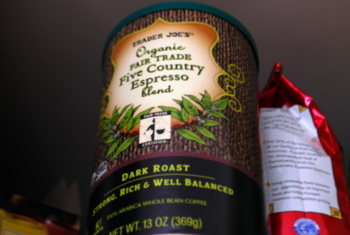 But when they were brewing samples of Trader Joe’s Organic Five Country Espresso Blend the last time I stopped into TJs, I liked it enough to give it a chance and bring some home with me. The coffee is strong and fruity, and while it doesn’t come close to the richness of a good espresso, it still had a bit of the smoky caramel note to it that makes espresso so good. It had a unexpectedly smooth finish, although not as smooth as the low-acid French Roast from TJ’s. I haven’t pulled any espresso with it yet, but I’m hoping that the fruitiness carries through and turns into a nice sweet-caramel combination in a shot. I’ll definitely pick this one up again.